Moisturize with a proprietary blend of fruit stem cells infused into a Vitamin C, resveratrol-rich grapeseed formula to create a visibly firmed appearance of the skin and reduce the appearance of fine lines and wrinkles. Certified organic, antioxidant-rich ingredients and plant oils hydrate and improve elasticity for lasting, advanced age defy results. 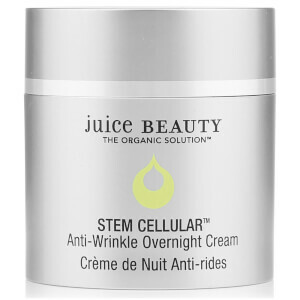 Juice Beauty's STEM CELLULAR™ Moisturizer is ideal for all skin types and especially beneficial for skin showing the signs of aging including fine lines, wrinkles, and sun damage. Fights free radical skin damage and creates a visibly firmed appearance of the skin. Smell great, terrible dispenser, not very moisturizing. Many products come with pump dispensers that work very well, not this one. I also don't find this product provides sufficient moisturizing for my dry skin and always have to layer another moisturizer on top. At this price point I'm very disappointed. I love this cream . I am very particular about the scent of creams that I use on my face. This has such a lovely fresh scent. While I am not crazy about the dispenser for this cream I have learned how to open the jar when the dispenser no longer responds. This cream is amazing. I'm 67 years old. I have used Juice Stem for over a year. It has made a huge difference in the tone of my skin. Less wrinkles and lines. I would highly recommend this product. But, give it a chance. Results are worth waiting for. I really do like this moisturizer; my skin started looking more hydrated within a few days and I believe it is helping with my lines and wrinkles.BUT- I am with every other person that is complaining about the container. Pump dispensers are always better because they keep the product from getting germs and bacteria from our fingers- but this dispenser is horrible. Within a week I could not get any moisturizer out and figured I had been sent a used container. I then realized if I store the container upside down I can still get product out.So the moisturizer is recommended, but make sure you store it upside down if you want to actually use it. What is up with the strange container? I'm torn with this one. 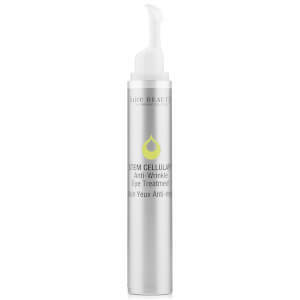 I love Juice Beauty Cellular Moisturizer a lot; the product itself is great and works really well. Its one of my favorites. But I have a big, BIG, problem with the odd container the product comes in. Instead of being able to screw the lid off the top, for some strange reason, someone at Juice Beauty labs thought a solid plastic, pump-action "dispenser" attached to the top was the way to go. Not only is it a waste of plastic but it's completely useless and you can't easily remove it: I'm going to have to take a screwdriver to the top once the product gets so low it won't pump out of that tiny hole in the top of the plastic. I implore the makers of this packaging to stop creating more plastic waste that only annoys those of us who don't want to have a complex (re: pointless) system just to get the product out of the container. Best in repairing our skin cells DNA ! I really like this product, smells great, feels great. I am waiting to see if it's going to transform my skin. I hope it does. I've used this product before, and after several very disappointing tries with other "natural" anti-aging moisturizers, I decided to try this again. It does have a very pleasant scent to it, and seems to provide "some" help for wrinkles, etc. but really NOTHING for deep wrinkles like in my brow. So, I may continue with it or move on, I haven't made up my mind. I love the way this moisturizes my skin, it is the best I've ever used. I HATE the container it comes in because I never know when i"m running low and I always feel there has to be some left in the jar but can't access it. I like the product. It works well and smells good. I don't like the container. Nice idea for portion control, but it does not allow you to see how much is in the container. No way to order before you run out.Please change the container!